The print size is 9x12" and it has a 1" border all the way around to accommodate framing. Paper size is 11x14". 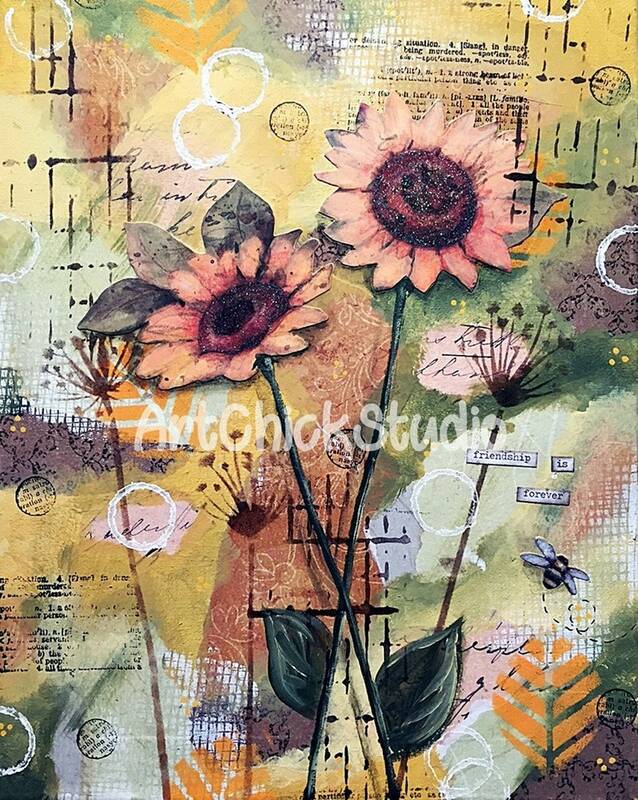 The original mixed media painting, that I call 'Sunflower Love,' was made with acrylics, colored pencils, acrylic paint pens, rubber stamps, paper and stencils. Watermark will *not* appear on your print. This item will ship USPS Priority Mail within 3 business days. If you would prefer First Class (for $3.95), let me know at checkout and I will refund $3.05 to your method of payment. With either shipping method, please allow up to 15 business days for delivery. If I can answer any questions, please let me know. I accept Pay Pal and Credit Cards for payment of your creative purchases. Due to the unique and artistic nature of some of my products, there are no returns or refunds for any Original Art, Art Prints, Custom Orders, or Digital Products and/or services. Other items *MAY* be considered for return with prior approval and only if the item(s) are in their original/unused/undamaged condition; return shipping will be at Buyer's expense and items must be shipped in the same method and packaging as they were originally sent to you. Please contact me if you wish to return something to get approval. Any damages caused in transit/shipment are only covered if the package was insured. Uninsured orders are at the buyer's own risk. All items are shipped either First Class or Priority Mail, depending upon the size of the item(s) in your order. I prefer Priority since that is trackable mail, but some smaller items will ship First Class since it is most cost effective to ship them that way. Additionally, all original artworks will only be mailed by Priority Mail, regardless of size. Your order will be shipped within 1-3 business days, and in most cases it is the very next business day. If there will be any delay, I will email you to let you know. Insurance is included automatically on all original art. Insurance is not included on any other orders unless requested by the buyer and at the buyer's expense--and you would be billed separately for that expense. At this time I am not shipping Internationally, but I may do so in the future. I do take requests for Custom Orders, so if you have an interest, just send me a message and I'll see what I can do for you.